An October 23, 2011 Holmes Report blog posting identified the two major fears that banks have relative to social media implementation: regulatory implications and loss of control. According to The Holmes Report, 73 percent of banks believe that they are behind but catching up in their social media activity. But the sector realizes that social media will not disappear: 16 percent have a social media strategy in place, 28 percent are in the early stages of implementation, and 41 percent are in the process of creating a social media strategy. This compares with 3 percent who have decided against a social media strategy and 13 percent who haven’t started thinking about it. The Holmes Report cites brand awareness as the most popular reason for social media usage. According tot the report, banks find Twitter as the most useful social media platform followed by LinkedIn. Addressing the regulatory implications is simple (easy for me to say). Any social media implementation should be preceded by a careful analysis. 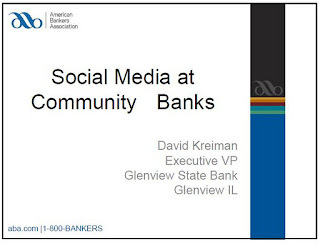 I recommend David Kreiman's recent presentation (Social Media at Community Banks) at the ABA National Convention as a starting point. 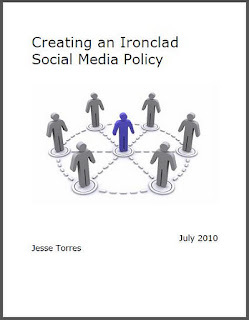 Next, I would recommend a review of Creating an Ironclad Social Media Policy. This document provides the policy guidance necessary to satisfy examiners, auditors and executive management. 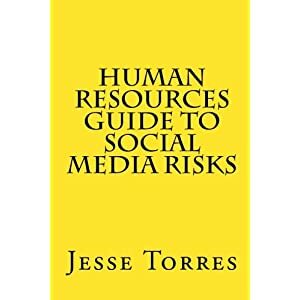 Finally, I would highly recommend that a copy of the Human Resources Guide to Social Media Risks be given to each member of senior and executive management. This book will provide a very good assessment of the risks that exist as a result of social media use. These three guides should provide the tools necessary to put any organization's fears into perspective. At the end of the process the conclusion should be, whether or not social media is for our organization, it is not going anywhere anytime soon and at a minimum, the organization better be listening to what other are saying in order to adequately manage reputation risk.